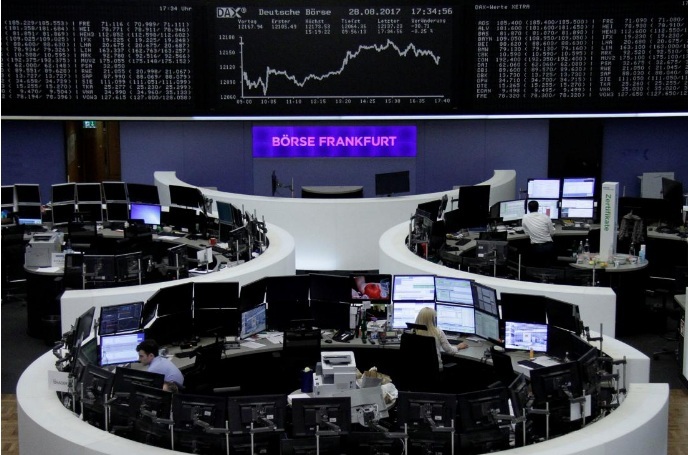 LONDON - Rising geopolitical tensions and a surging euro sent European shares to their lowest in six months on Tuesday after a missile launch by North Korea sapped Asian markets. The pan-European STOXX 600 fell 1.5 percent, set for its worst daily performance in nearly 14 months and firmly on track to make August its third month of losses in a row. Political risks and a strengthening currency denting exporters have put pressure on European benchmarks. On Tuesday the euro EUR=EBS surged above $1.20 for the first time since January 2015, after European Central Bank Chief Mario Draghi refrained from talking down the currency which has gained 14 percent year-to-date against the dollar. The euro effect combined with a broader risk-aversion mood to send euro zone stocks and blue-chips down 1.3 percent. Britain’s FTSE .FTSE fell 1.4 percent and the exporter-heavy DAX .GDAXI hit a five-month low. North Korea fired a missile over northern Japan, weakening Asian stocks and the U.S. dollar overnight. As geopolitical concerns spread to European markets, all sectors fell and among the only bright spots were gold miners Randgold Resources (RRS.L) and Fresnillo (FRES.L), up 3.1 to 3.8 percent as the price of gold soared to a 9 1/2 month high with investors rushing into safe haven assets. Banking stocks .SX7P sank 1.3 percent to a two-month low. The VSTOXX .V2TX, a gauge of European investor anxiety, jumped to its highest in a week. German commercial broadcaster Prosiebensat fell as much as 13 percent to a near three-year low after flagging a weaker outlook for advertising in the third quarter, the third cut in advertising guidance this year according to Deutsche Bank analysts. “The most direct negative read-through is for German peer RTL,” said analysts at the German bank. “But this also represents another major piece of evidence of the disconnect between solid European macro trends and weakening TV ad momentum,” they added. German peer RTL Group (RRTL.DE) dropped 8 percent, while Spanish and British broadcasters Mediaset Espana (TL5.MC) and ITV (ITV.L) both also fell 3.5 to 5 percent. The losses heaped pressure on the media sector .SXMP, the second worst-performing in Europe this year, down 2.5 percent on the day. Lundin Petroleum sank 7 percent after its Korpfjell prospect, a joint venture with Statoil in the Arctic Barents Sea, found no oil and only non-commercial quantities of natural gas. Shares in French investment firm Wendel jumped 3.5 percent after an upgrade to "buy" from Societe Generale, whose analysts praised the firm for increasing its loan-to-value ratio and the share of unlisted assets in its portfolio. With the Jackson Hole symposium yielding no big change to monetary policy expectations, and an earnings season meeting lukewarm share reactions, catalysts to support European equities were scarce. Some investors expected a correction, though valuations in the region remained attractive relative to Wall Street.